The below artworks are the most important by Charles Rennie Mackintosh - that both overview the major creative periods, and highlight the greatest achievements by the artist. 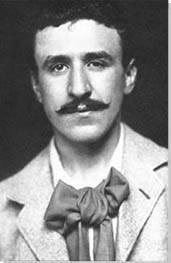 Artwork description & Analysis: Mackintosh redesigned both the interior and exterior of the Glasgow School of Art to stand as a shining example of his early, forward-looking, pluralist architecture. The building was made of stone in order to reference Scottish Baronial tower houses, which Mackintosh considered incredibly modern in their original use of iron and glass. 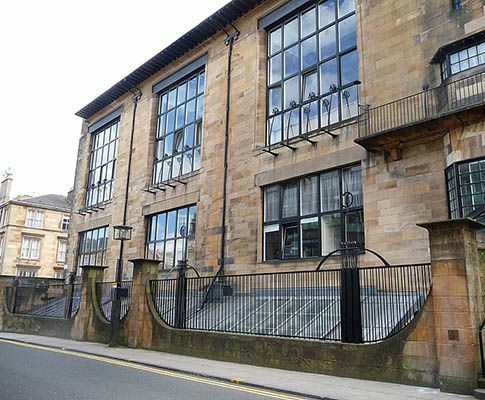 Mackintosh was always sensitive to surrounding architecture and existing national traditions but at the same time added his own free style aesthetics; on the left-hand side of the building there is an entrance reminiscent of an ancient ziggurat built to unusual, non-classical proportions. As such he seamlessly merges a wide variety of different influences. 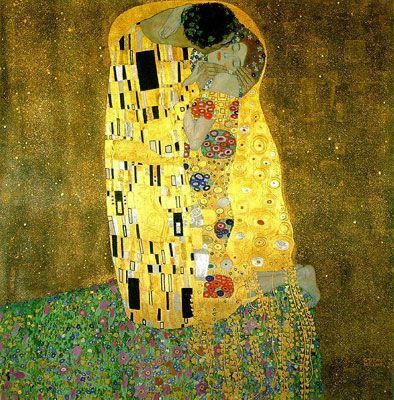 Artwork description & Analysis: Mackintosh began to design the interior for his own Glasgow flat shortly before his marriage to Margaret Macdonald, and the two of them moved in soon afterwards. While Mackintosh largely left the original features intact he rearranged the rooms to create what Cairney has praised as a "living, three-dimensional work of art, a breathtaking space within four square walls". 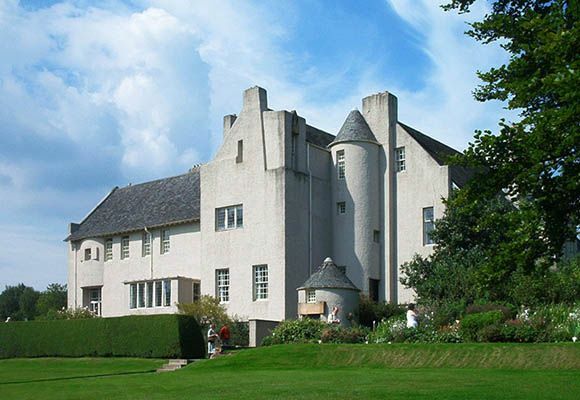 One of Mackintosh's friends, Muthesius, described the home as a "fairy-tale world" and noted that even a book left out would disturb the minimalist and perfectly harmonious scheme. Even the fireplace had been lovingly modified with a curved wooden top piece in order to soften it and to make the overall space feel more homely. The couple's furniture, pictures, and cushions for the cats were added. Artwork description & Analysis: In 1900 Mackintosh and Macdonald were invited by the architect and figurehead of the Viennese Secession, Josef Hoffman to present a collaborative design for "The Scottish Room" at the 8th annual exhibition of the movement held in Vienna. The result was a recreation of one of the many tea room interiors that Mackintosh had designed in Glasgow. Changes were made furnishing the space however, making it relatively sparse overall, but with a show-stopping piece by Macdonald hanging on the wall. Macdonald had made a large oil-painted gesso on hessian piece (her typical media) that featured five women depicted in her signature overlapping and floral style. It had originally been made for Miss Cranston's Ingram Street Tea Room and named The May Queen. 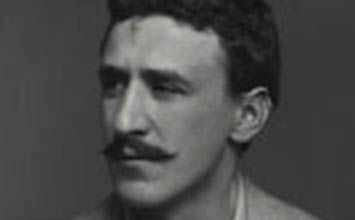 Admired greatly by Mackintosh, he said of his wife's work, "Margaret has genius, I have only talent". Artwork description & Analysis: Tea rooms were a popular alternative to working men's clubs in Glasgow and had arisen from the campaigns of Scotland's vibrant Temperance movement (which stood against the consumption of alcohol). 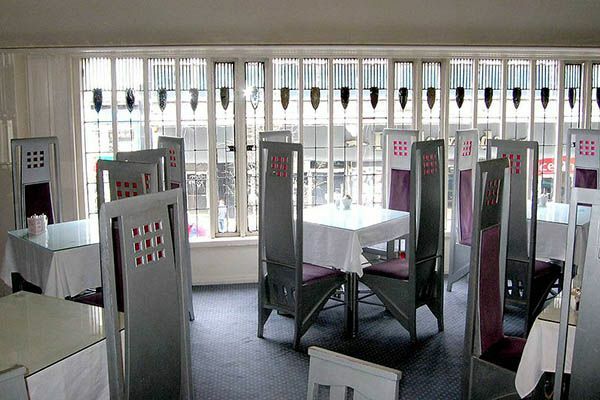 Catherine Cranston opened a number of these tea rooms in Glasgow and all were designed by Mackintosh, to whom Cranston had entrusted complete creative freedom. Artwork description & Analysis: This building once again highlights Mackintosh's eclectic tastes and influences. He said himself, "It is not an Italian Villa, an English Mansion House, a Swiss Chalet, or a Scotch House. It is a Dwelling House." 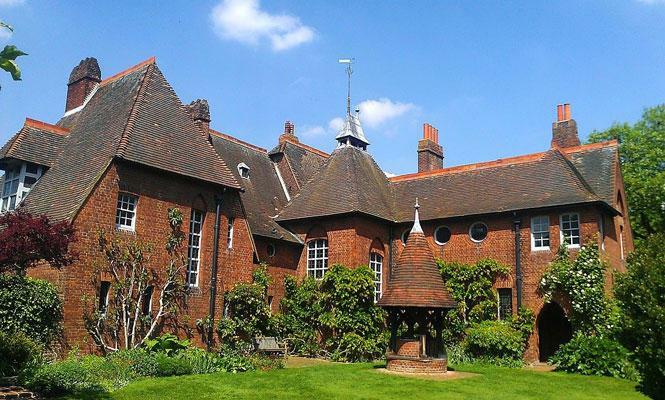 Here in particular, as well as traces of the Scottish Baronial style, there is also strong influence coming from the Arts & Crafts movement, and more specifically, from the architecture of CFA Voysey. Artwork description & Analysis: By 1900 Mackintosh's flower studies had begun to emerge as an important part of his overall body of work. 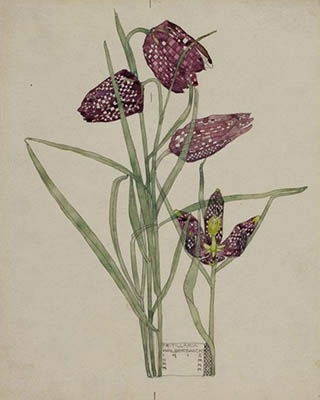 Having left London and staying in Walberswick in Suffolk he completed approximately 30 flower watercolors in a standard format intended for a book publication. Unfortunately this plan did not come to fruition due to the onset of the First World War.